Below: Amaryllis Alfresco, an opulent, almost triple-flowered Amaryllis! Right: Amaryllis Picotee is an old favourite, so named because of the red picotee along the edges of the bloom. 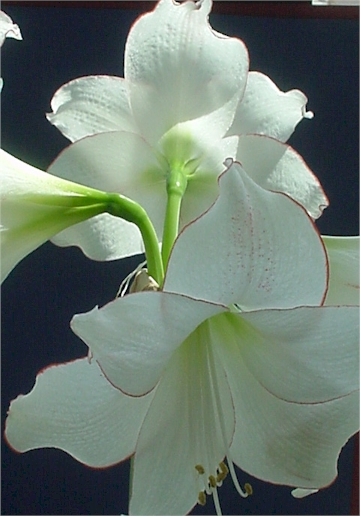 There is nothing as pure and pristine as a white Amaryllis flower. Irrespective of the variety, every grower should have at least one white in their collection. Even within the range of whites, there is a variety of flower shapes and sizes. Some are even double-flowered. These "double Amaryllis", as they are known, have two sets of petals on each flower creating a lovely opulent ruffled bloom. 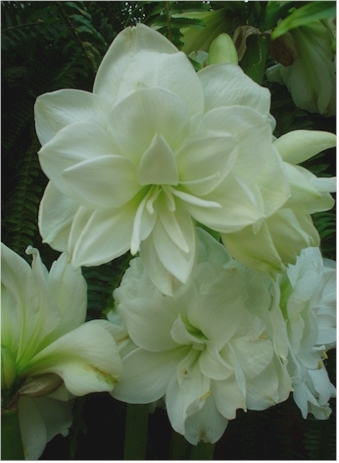 Most Amaryllis have a greenish cast at the base of the petals and this is seen to great effect in white flowers.